View Cart “Detroit Red Wings” has been added to your cart. In Diamonds from the Dugout, baseball stars were asked the question: What hit meant the most to you and why? It was a simple question of nine words, a magical number in baseball, and it led award-winning sportswriter Mark Newman on an eight-year journey that would bring about surprising stories and empowering life lessons from the minds of the most fabled Major League hitters in our time. SKU: BD70679. Categories: Sports & Recreation, Baseball. Tags: baseball, Hall of Fame, hit, HoF, Major League, Mark Newman, MLB. Charming tales of heroic moments are delivered in a very different and captivating way, as unique as the men who made them happen right before our eyes. It all started with the beloved Hall of Fame third baseman Brooks Robinson, whose eager response was a much-needed lesson in humility as well as inducement to ask it again. From one legend to the next, the answers were unexpected, introspective, telling, and most of all inspiring. 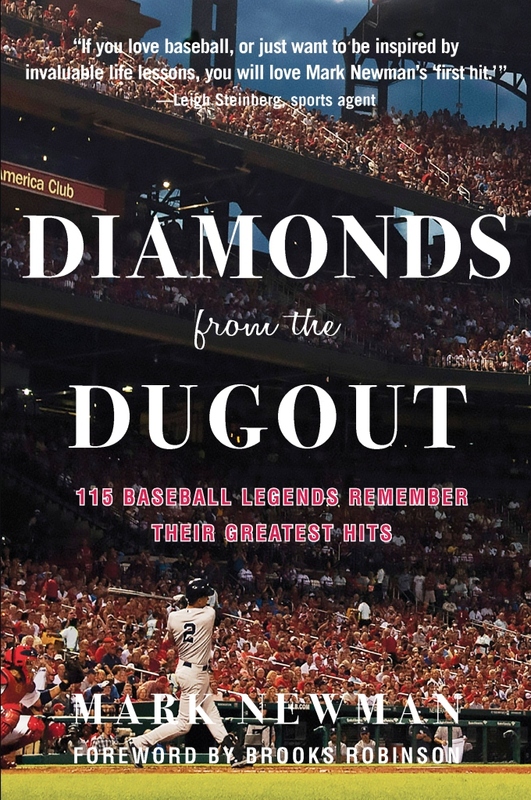 Diamonds from the Dugout is a collection of motivational lessons on achieving success in life, organized through stories shared by such greats as Derek Jeter, Stan Musial, Ken Griffey Jr., Pete Rose, Carl Yastrzemski, Wade Boggs, Frank Thomas, Mike Piazza, Cal Ripken Jr., George Brett, Johnny Bench, Brooks and Frank Robinson, Rickey Henderson, Tony Gwynn, Albert Pujols, Mike Schmidt, Carlton Fisk, Joe Morgan, Tony Perez, Jim Palmer, Robin Yount, Andre Dawson, Lou Brock, Ozzie Smith, Roberto Clemente (via wife Vera), Dave Winfield, Ferguson Jenkins, Joe Carter, Steve Garvey, Ralph Kiner, Roberto Alomar, Bo Jackson, Dale Murphy, Darryl Strawberry, Don Mattingly and more than 100 of our favorites of all-time. Mark Newman is a recipient of the National Magazine Award for General Excellence and has been a baseball writer since 1990, including nearly the last two decades with Major League Baseball Advanced Media (MLB.com). The Indiana University graduate is a longtime Hall of Fame voting member of the Baseball Writers’ Association of America working 25 World Series. Before MLBAM, he co-founded and oversaw content at digital ventures including Sporting News Online, NASCAR.com, MAX Broadcasting Network. Before that, he was an award-winning pro sports beat writer for The Miami Herald, Fort Worth Star-Telegram, and San Jose Mercury News.